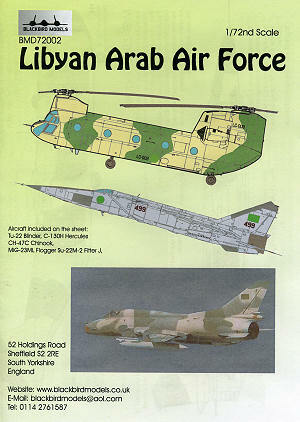 For their second sheet, Blackbird Models has decided to do one on the Libyan Arab Air Force. This is a country about which little has been done in terms of modeling and that has now changed. 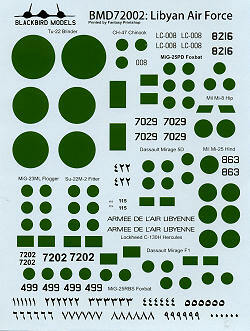 The sheet provides markings for a variety of aircraft that are or have operated with the solid green insignia of the current regime. In addition to the specific serial numbers provided by the sheet, an additional batch of Arabic numbers are given for this sheet or perhaps some other projects, a nice touch. The sh eet itself is very nicely printed by Fantasy Print Shop. Nothing overtly colorful in the markings; the planes will provide all of that. Of course, many of you will realize that you can use Matchbox or ESCI or Airfix or ICM for a few of these where it applies. I'm sure there are others that have slipped by me as well that could be used. 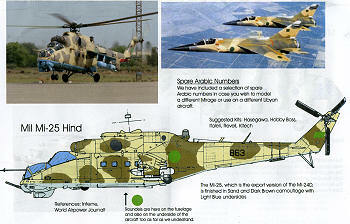 So there you have it, 11 great schemes for some of the less modeled aircraft. It is a great sheet and is one you really should consider for your next project.